There are no pre-course requirements for the RYA Day Skipper theory course but some sailing knowledge is helpful. Ideally some sailing experience on an RYA practical course such as competent crew or some dinghy sailing is sufficient but not essential. Even a flotilla holiday with friends is enough to give you a good idea why you should enroll in the RYA Day Skipper theory course. Why you should choose this course. 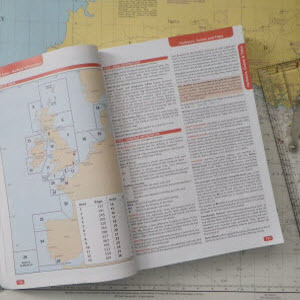 Our course price is £ 285 for the Day skipper includes the RYA pack containing practice charts, the RYA Chart Plotter Simulator, the RYA Day Skipper course notes, the RYA practice Almanac and the RYA Day Skipper question paper. 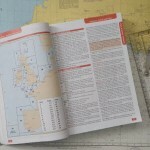 In addition you have an RYA Ocean Yachtmaster Instructor to help if needed. The RYA course pack containing the RYA course notes, an RYA practice almanac, two RYA practice charts, The RYA plotter simulator, connection to the online course and questions, a free Portland type plotter, a pair of brass dividers, free postage to anywhere in Europe and personal help throughout your course from our fully qualified instructors. Tidal heights and streams:- what causes tides, terminology, tidal height calculations, using tide tables, using the tidal curve, introduction to secondary ports, tidal streams using tidal diamonds and the tidal stream atlas. Meteorology:- Weather forecasts, weather systems, global effects, local effects, highs and lows and sources of weather information. Passage planning:- Puts everything together to form a plan for a safe passage taking into account pilotage for entering and leaving marinas and tides, conditions and wind direction for the main passage. Passage making:- Making a longer passage taking into account tidal heights, streams, port entry and exit, weather, ports of refuge, waypoints, crew management and supplies.